Now in its 29th year, the Stephen Joel Trachtenberg Scholarship Program gifts tuition, room, board, books and fees to exceptional students. Elizabeth Lozano entered her classroom at Calvin Coolidge High School Wednesday to deafening cheers from an unexpected crowd of classmates, mentors, loved ones and strangers. 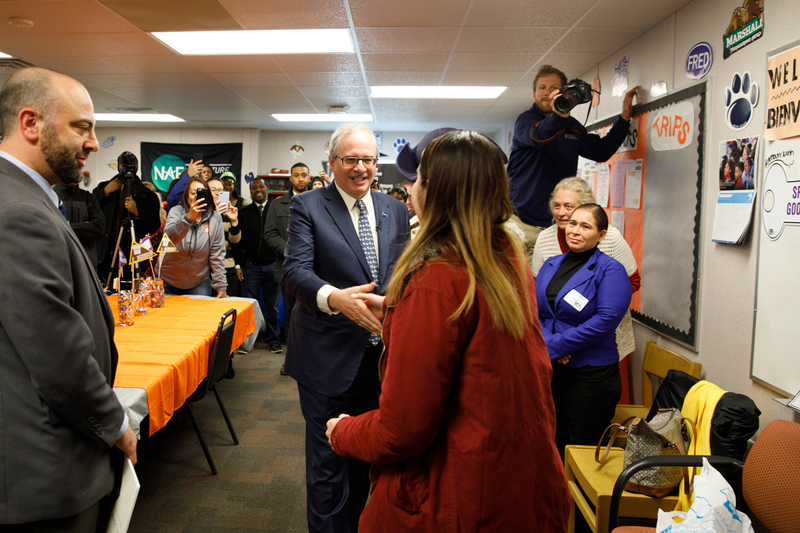 As she looked around, wide-eyed, George Washington University President Thomas LeBlanc and Dean of Admissions Costas Solomou came forward to share good news. 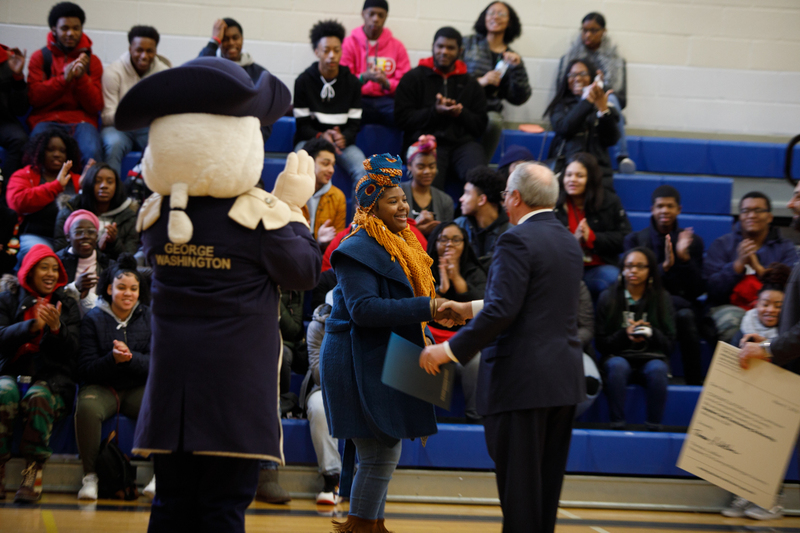 Ms. Lozano would be one of 10 exceptional D.C. students to receive a Stephen Joel Trachtenberg Scholarship, covering the entire cost of their college education at GW. “We are so proud of you,” yelled one staff member. “God is good!” another called. The GW awards team, including Dr. LeBlanc, Dr. Solomou, GW mascot George and more, spent Wednesday traveling to nine schools in Washington, D.C. 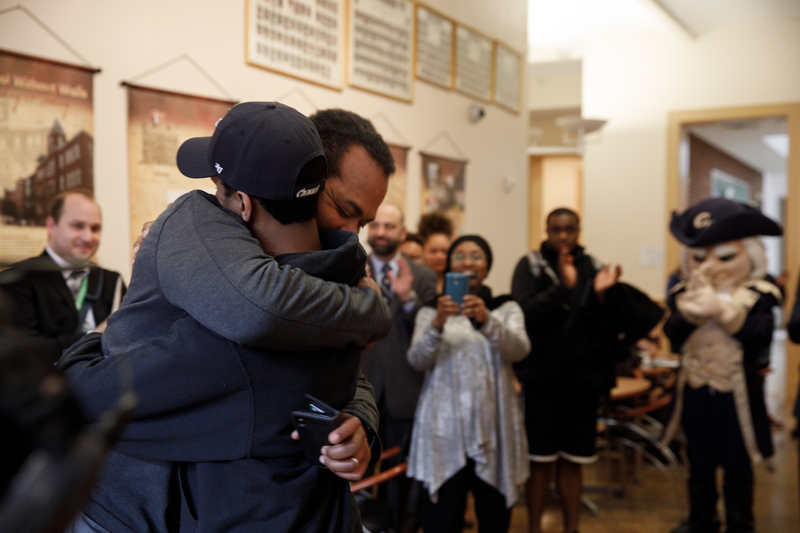 They surprised 10 students with hand-delivered acceptance letters and the news that their full college education—four years of tuition, room, board, books and fees—would be paid for. Often, the students’ proud families accompanied them. It wasn’t just the families who were excited. School counselor Linda James has known Ms. Lozano since she was four years old. Back then, Ms. James was Ms. Lozano’s Head Start teacher. Since 1989, the SJT scholarship program has enrolled 174 District of Columbia students with full-ride scholarships covering all four years of their undergraduate education. GW selects students based on high school academic performance, strength of curriculum, recommendations, leadership qualities, community service, extracurricular activities and achievements and standardized test scores, should they choose to submit them. Students are nominated by their high school counselors and go through an interview process before being chosen. All D.C. residents graduating from an accredited high school in the District—public, charter or private—are eligible to receive an SJT scholarship. The scholarships are renewed annually, based on satisfactory academic progress at the university. 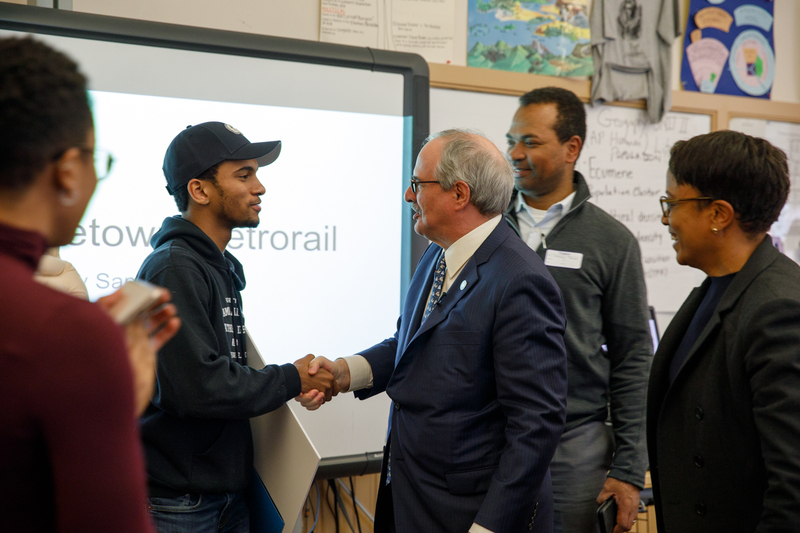 The SJT scholarship program is one of many GW initiatives aimed at improving access to a college education for high-achieving students of all backgrounds. GW’s July 2015 announcement that it will no longer require most undergraduate applicants to submit SAT or ACT test scores was another. Others include the university’s participation in D.C. College Application Week, its Early College Program at School Without Walls, the District Scholars Award and partnerships with the Posse Foundation and Say Yes to Education. Some surprises were spectacular. At Thurgood Marshall Academy Public Charter School in Anacostia, recipient Aniyah Fields was serenaded with a spontaneous foot-stomping cheer. 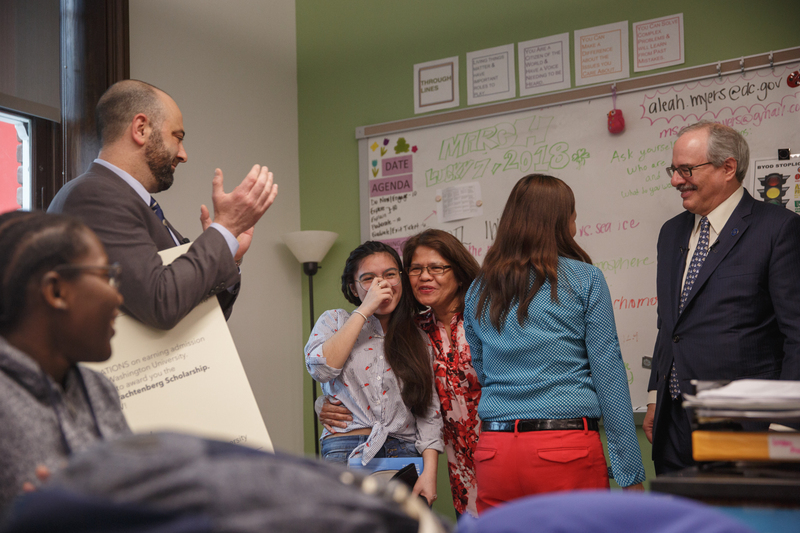 At Theodore Roosevelt High School in Petworth, Interim D.C. Public Schools Chancellor Amanda Alexander was on hand to congratulate winner Clau Diah Buenconsejo. This was Dr. LeBlanc’s first year distributing the scholarships, and he said his favorite moments were meeting the scholars’ parents and experiencing their pride and relief. Alejandra Valdes-Rivas was sitting with a group of classmates in the library at Francis L. Cardozo Education Campus when the unexpected procession of guests entered. This time, the entourage behind George included half a dozen members of the Valdes-Rivas family, all bearing balloons and flowers. Ms. Valdes-Rivas gasped, one hand flying to her mouth. Ms. Valdes-Rivas’s younger brother Peterson, a sixth-grade student with a shy smile, stood by, still holding his bunch of balloons. 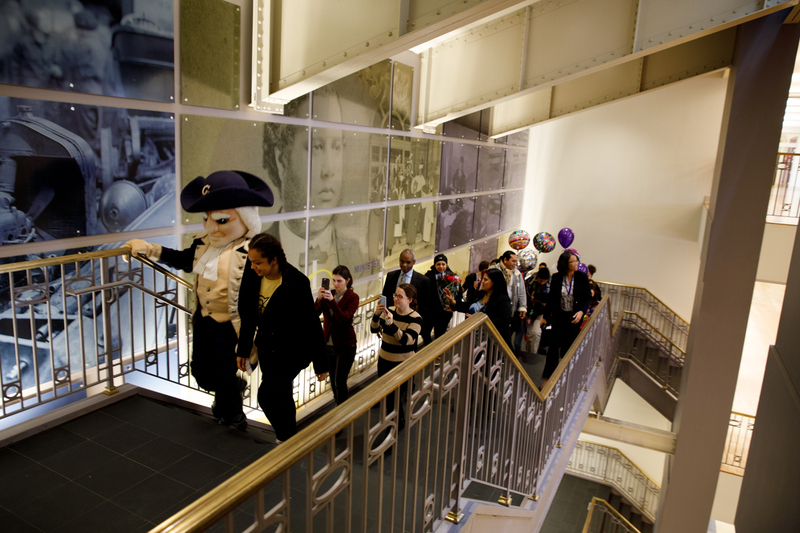 GW surprises 10 D.C. students with full-ride Stephen Joel Trachtenberg Scholarships.